The combination of Alexander LAN service and SyAM software simplifies the management of your IT assets, data centers and even the power used by it all. And, regardless of whether your environment is small or large, all you need to access and manage your complete enterprise network is a simple browser. When systems crash, be they servers, desktops, laptops, notebooks or even many point-of-sale systems (POS), we can help. In many cases the problem can be solved by a quick look at a Windows memory dump. Asset tracking is not only a sound accounting practice, it is critical to business planning, accurate financial statements and compliance. While not all offices have to deal with SOX, HIPAA, and other forms of federally enforced legislation, software compliance is ubiquitous to all IT departments and our solutions make it simple. Energy costs continue to rise and to be a significant drain on any business, organisation, or government office. Our Power Management solution tracks the energy use of your systems and helps you reduce costs up to 40%. One of the biggest drains on the productivity of administrators is making multiple trips to fix a problem: one trip to diagnose, one trip to install new hardware or software, and one follow-up trip to ensure everything is working. Our Remote Management solution provides direct access and control of all devices from your own PC. Many organizations simply do not have the necessary information to see how their IT environment has performed in the past. Reports are a great way to analyze trends and take action to pave the way for an efficient future moving forward. Our customizable reports make sense of it all. By managing your data centers more efficiently, you will save money that can then be allocated towards other parts of your business, while simultaneously decreasing your carbon footprint. With so many systems within an organization, distributing applications and rolling out patches to every machine can be a time consuming process. We give you the ability to drill down into machines to find out which ones need a security patch or a software update then deploy that software automatically. 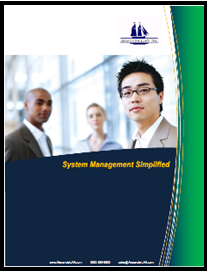 There is constant pressure on administrators to reduce system downtime that interupts office productivity. With so many employees and different devices, it can be a difficult task to track the health of servers, PCs, and mobile devices. We provide a bird's eye view into all of those systems from a single browser-based screen. With numerous types of hardware and software issues on a variety of different types of systems, it can be a difficult task to provide tech support to multiple end-users effectively. We offer solutions that allows administrators, end-users and technicians to access a ticketing portal; tickets can be created, tracked and resolved, and reports generated easily.